Emir Muhammadu Sanusi II, is the Emir of the Kano Emirate serving since 8 June 2014. He was crowned as Emir of Kano, after the death of his grand uncle Ado Bayero (who died on 6 June 2014). 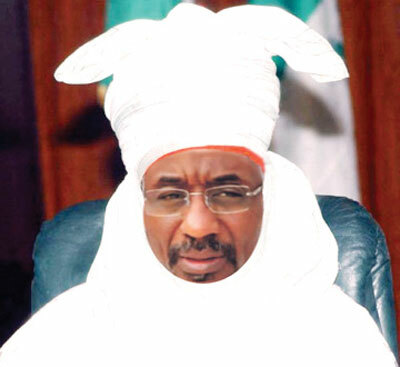 Malam Sanusi was a successful banker and was a former Governor of the Central Bank of Nigeria. He was appointed on 3 June 2009 for a five-year term, but was suspended from office by President Goodluck Jonathan on 20 February 2014 after claiming that a $20 billion fraud was committed in the Nigerian National Petroleum Corporation (NNPC). Sanusi had his primary education at the St. Anne’s Catholic Primary School, Kakuri, Kaduna between the years 1967-1972, where he obtained his First School Leaving Certificate. Lamido Sanusi had his secondary education at King’s College Lagos, where he graduated in 1977. He got admission into Ahmadu Bello University (ABU) Zaria, where he obtained a bachelor’s degree in Economics in 1981. He furthered his studies and obtained a master’s degree in Economics at Ahmadu Bello University in 1983, and became an instructor there from 1983 until 1985. Sanusi also studied in the International University of Africa, Khartoum, Sudan, where he obtained a degree in Islamic Law. Sanusi was posted to Gongola State (now Adamawa and Taraba States) where he did his National Youth Service Corpse (NYSC) mandatory service. In 1985 Sanusi got employed by the Icon Limited (Merchant Bankers), a subsidiary of Morgan Guaranty Trust Bank of New York United States, and Baring Brothers of London. He later joined the United Bank for Africa in 1997, working at the bank’s Credit and Risk Management Division, he rose to the position of a General Manager. In September 2005, he became one of the Board members of First Bank of Nigeria as an Executive Director in charge of Risk and Management Control. Later he was appointed Group Managing Director (CEO) in January 2009. Almost at the same period, Sanusi was also the Chairman, Kakawa Discount House, where he sat on the Board of FBN Bank (UK) Limited. Sanusi was the first person from the northern Nigeria to be appointed CEO in the history of First Bank in Nigeria. On June 1, 2009, during the presidency of Umaru Musa Yar’Adua, Sanusi was nominated as Governor of the Central Bank of Nigeria and his appointment was confirmed by the Nigerian Senate on June 3, 2009 at the height of the a global financial crisis. Lamido Sanusi graduated from King’s College Lagos in 1977 and attended Ahmadu Bello University (ABU) Zaria where he earned a bachelor’s degree in Economics in 1981. He obtained a master’s degree in Economics at ABU (1983) and was an instructor at ABU from 1983 to 1985. In 1985 Sanusi joined Icon Limited (Merchant Bankers), a subsidiary of Morgan Guaranty Trust Bank of New York, and Baring Brothers of London. He moved to the United Bank for Africa in 1997 in the Credit and Risk Management Division, rising to the position of a General Manager. In September 2005, he joined the Board of First Bank of Nigeria as an Executive Director in charge of Risk and Management Control, and was appointed Group Managing Director (CEO) in January 2009. He was also the Chairman, Kakawa Discount House and sat on the Board of FBN Bank (UK) Limited. Sanusi is recognized in the banking industry for his contribution towards developing a risk management culture in Nigerian banking. First Bank is Nigeria’s oldest bank and one of the biggest financial institutions in Africa. Sanusi was the first northerner to be appointed CEO in First Bank’s history of more than a century. Read ALSO: Nigeria Retains No.1 Spot As The Most Mobilized Country. President Umaru Musa Yar’Adua nominated Sanusi as Governor of the Central Bank of Nigeria on 1 June 2009 and his appointment was confirmed by the Senate on 3 June 2009, in the middle of a global financial crisis. Analysts believed that Sanusi’s tempered mien would serve as a counterpoise to the more aloof disposition of his predecessor, Charles Chukwuma Soludo. Based on his past record, it seemed probable that as governor of the central bank he would impose stricter controls. In August 2009, the Sanusi led the Central Bank to “rescue” Afribank, Intercontinental Bank, Union Bank, Oceanic Bank and Finbank by bailing them out with 400 billion naira of public money, and dismissed their chief executives. Some point to other factors including religious, ethnic and existing bank records and plans to say he in fact had a hidden agenda. He said “We had to move in to send a strong signal that such recklessness on the part of bank executives will no longer be tolerated.” 16 senior bank officials faced charges that included fraud, lending to fake companies, giving loans to companies they had a personal interest in and conspiring with stockbrokers to boost share prices, and today he has been appointed as the Emir of Kano by Gov. Rabi’u Musa Kwankwaso of Kano following the departure of Alh. Ado Bayero. In September 2009, he said that 15 of the current 24 Nigerian banks might survive reform in the banking sector. In a wide-ranging interview with the Financial Times in December 2009, Sanusi the extensive reforms that he had initiated since taking office, dubbed by some as the “Sanusi tsunami”. Some believe that he had a personal vendetta against some of the bank CEOs while others point to proof of mismanagement of funds by some of the CEOs, most notably Cecelia Ibru as justification for the steps he implemented. He noted that there was no choice but to attack the many powerful and interrelated vested interests who were exploiting the financial system, and expressed his appreciation of support from the Presidency, the Economic and Financial Crimes Commission, the finance minister and others. In January 2010, Sanusi said that banks will only want to give credit to Nigeria’s small and medium enterprises (SMEs), if the government gives adequate attention to the provision of infrastructure. In January 2010, Sanusi admitted that since 2005 the Central Bank had not conducted routine examinations of the 14 banks allocated to it under the sharing arrangement with Nigerian Deposit Insurance Corporation (NDIC). Abubakar Nagona, president of Integrated Development and Investment Service (IDIS), a venture capital investment company urged Sanusi to “not be cowed and succumb to undue pressure from operators of the same sector he is striving to bring sanity to.” At a February 2010 conference on banking in Nigeria, Sanusi described his blueprint for reforming the Nigerian financial system. He said that it was built around four pillars of enhancing the quality of banks, establishing financial stability, enabling healthy financial sector evolution and ensuring that the financial sector contributes to the real economy. Talking later that month, Sanusi said that the crash in the capital market was due to high level of financial illiteracy on the part of Nigerian investors. Read ALSO: Rapper VIC O Full Biography. The Banker recognized him as the Central Bank Governor of the Year 2010 citing his radical anti-corruption campaign aimed at saving 24 banks on the brink of collapse and pressing for the managers involved in the most blatant cases of corruption to be charged and, in the case of two senior bankers, imprisoned. Sanusi has spoken at many distinguished events, including Warwick Economics Summit in February 2012 where he spoke about banking reforms in Nigeria and their impact on the economy. At a conference in 2000 in Kaduna, Sanusi delivered a lecture on Islamic economics called Institutional Framework of Zakat: Dimension and Implications. He argued that although collection of zakat is the responsibility of the state, it may be the responsibility of the Nigerian government rather than the emirs in Northern Nigeria. In July 2001 at a seminar in Abuja he talked on Basic Needs and Redistributive Justice in Islam – The Panacea to Poverty in Nigeria. He took the mainstream position that zakat is an instrument for redistributing income, but argued in favor of giving the role of redistribution to the government. In October 2002 he published a paper on The Hudhood Punishments in Northern Nigeria: A Muslim Criticism. In July 2003 he presented The Shari’a Debate and the Construction of a ‘Muslim’ Identity in Northern Nigeria: A Critical Perspective at a seminar at the University of Bayreuth. In August 2003 he presented Democracy, Rights and Islam: Theory, Epistemology and the Quest for Synthesis at an international conference on Shari’ah Penal and Family Law in Nigeria and in the Muslim World: A Rights-Based Approach in Abuja. There are two underlying themes to Sanusi’s position. First, Islam is concerned with delivering justice and should not be a tool for self-seeking political agendas. Second, the Wahhabist rhetoric of fundamentalists is counter to genuine Muslim interests. He explains that Sharia is not divine but merely religious, and is neither uniform nor unchanging. Economists have tended to favor the removal of subsidies. He cites the high level of corruption engendered by the practice, the inefficiency of subsidizing consumption instead of production leading to slower economic growth, and the fact that the government borrows money to finance the subsidy, in effect taxing future generations so that current Nigerians can consume more fuel. Sanusi, other economists and development practitioners also cite that the subsidy is heavily biased in favor of the small middle- and upper-class who use most of the fuel. Additionally, some people purchase the subsidized gas in Nigeria to resell it in other West African countries. The PBS segment quoted American and British officials saying that former Petroleum Minister Diezani Alison-Madueke might personally have organized a diversion of $6 billion (N1.2 trillion) from the Nigerian treasury. She was arrested in London on October 2, 2015. Sanusi believes he was fired from the Central Bank of Nigeria because he went public with charges that $20 billion was missing from the Nigerian National Petroleum Corporation (NNPC) under Alison-Madueke’s management. Alison Madueke says Sanusi made the allegations to retaliate after she didn’t help him to get appointed as the president of the African Development Bank (AfDB) and dismissed his allegation. Sanusi was selected to succeed his grand uncle Ado Bayero as the Emir of Kano on 8 June 2014. There was great controversy over the appointment. Some believed that it was politically motivated and a move to avoid charges of fraud from his term as the governor of the Central Bank of Nigeria. Many also expected Bayero’s son to succeed him as Emir and supporters of Bayero’s son angrily protested Sanusi’s appointment. He was formally crowned as Emir Muhammadu Sunusi II on 9 June 2014 making him the 14th Emir of Kano and the leader of the Tijaniyya Sufi order, historically the second most important Muslim position in Nigeria after the Sultan of Sokoto, the leader of the more populous Qadiriyya sufi order. After he urged his followers to fight back against the Nigerian Islamist group Boko Haram, the Kano Mosque, the seat of his emirate, was bombed in November 2014, killing 150. In December 2014, Boko Haram leader Abubakar Shekau, accused him of deviating from Islam and threatened to kill him. Sanusi replied that he is “safe with Allah” and likened Shekau’s comments describing Sufis as unbelievers to those of the heretical Islamic preacher Maitatsine.